Getting her to return a phone call is impossible. You’d have better luck sticking a Dr. Pepper under a propped up box and waiting nearby, string in hand. Hi, Lexie, welcome. We don’t often get kids in the pub. Would you like a bendy straw in your Dr. Pepper? I drink my Dr Pepper like an adult, Bishop. LIKE AN ADULT. On the rocks, flavored with my own tears, and alone in a bar in west Texas somewhere. Okay, let’s cut to the chase, you call yourself Lexie Dunne, but we all know that’s not your real name. Rumor has it your real name, when spoken aloud, has been known to summon any of the following at different times; the muffin man, the good humor man, Stan Lee, and the dark lord Cthulhu. Is it true? And what of the reports that Cthulhu appeared at an elementary school you were attending for second grade, moments after the teacher took attendance? Ah, yes. Poor Mrs. Harris. You’d think a woman who deals with seven-year-olds that glue their fingers together with paste on a regular basis would be better equipped to handle an Elder God or two, but sadly, that proved not to be the case. She was a great teacher for all of the ten minutes that I had her on that first day. Cthulhu and I have worked out a deal. My middle name also needs to be spoken aloud to summon him, but the Muffin Man is fair game at any time. Luckily, the only woman who knows that middle name is also way more terrifying than either of those monsters. Hi, Mom! No comment on Stan Lee. Nicely done on the mom shout out. Now, your first book revolves around a woman who is repeatedly taken hostage by various super powered criminals, and often injured when rescued by the superhero everyone thinks is her boyfriend. How much of this book is autobiographical? Pretty much everything but Gail’s height. She’s 5’1, I’m 5’4. Other than that*, we’re practically separated at birth. * And her muscles, sense of humor, sarcasm, wit, curly hair, having two very built dudes in love with her, and the ability to tuck away an entire Thanksgiving feast as a midmorning snack, that is. What is it you love about superheroes and/or comics? Do you remember the first comic you read? Superheroes, to me, have always been about hope. Usually they’re underdog stories, which I’m a sucker for (to the surprise of absolutely nobody), but going back to my very first superhero film, The Rocketeer, I like these stories of people who try to be good folk even while they have these crazy responsibilities and pretty nifty abilities. I’ve never been a big fan of the Alan Moore type stories that are grimdark and gritty; I like my stories brightly flavored and preferably in shiny colors (to keep me from getting distracted). And my first comic that I ever read was Buffy Season Eight. I happened to be visiting NYC on a school trip the day it came out, so I went and found Forbidden Planet, bought my sister a Spider-Girl poster, and purchased my very first comic. I didn’t take to superhero comics until Captain Marvel in 2013. And now that I feel really old, let’s move on. Are you in favor of the Oxford Comma, or are you one of the demented anarchists who, when not torturing puppies, oppose its use? I am also a big fan of the vocative comma, too! No puppies are being tortured on my watch. I mean, mine might be overfed, but she’s currently being a cavetroll and breathing heavily behind me, but that might be the painkillers. The dentist told me there’s a 1 in 5000 chance that they’ll turn her into one of the ugly green gremlins. Enough of the softball questions, let’s get serious. Marvel or DC? Marvel for movies and comics, DC for select TV shows. Arrow doesn’t count because of what they did to Sara Lance. They’re still dead to me. May God have mercy on their souls. How big of an influence would you say a love of comics has on your writing, not just storyline (that’s obvious), but tone, and style? Less than you would think. I call Superheroes Anonymous a love letter to comic books, but the truth is, I didn’t actively start reading comics or set up a pull list or follow authors until several years after I wrote it. The second draft was written after I’d become a fan of the DeFractions and Marjorie Liu and G. Willow Wilson and Bendis, so I think I may have leaned a little more heavily on some comic book tropes in the final product? But the first draft, that was entirely my love of superhero movies and cartoons and osmosis from comics. Interesting, really shows how far comic book tropes have spread into main stream media. While working on your second book did any of your characters surprise you? Or would you say when you start writing you have a pretty clear idea of how things will go? I’m not one of those writers that says things like “The character told me this today!” because frankly, it all comes out of my head. But I think at times I was surprised by the twists my brain came up with and the direction the story took. I’m not a seat of the pants writer; generally before I kick off into a project, I have an idea of major scenes without any idea what connections will arise between them. The fun of writing, and the most frustrating part of writing, is that puzzle game you play when you try to take the ideas in your head and to figure out the pathways between them. Hopefully in a clear and coherent manner, but that’s not always necessary. Sometimes I just like making extra work for my editor. But yes, there were definitely times during the writing process of this book—which I wrote very, very quickly—where I surprised myself in both good and bad ways. And I wouldn’t have it any other way. Answer to be given next interview. Thanks, Lexie, it’s been fun. *gives secret handshake* Good luck on your books and that whole Stan Lee/Cthulhu thing. New superhero Gail Godwin, the one and only Hostage Girl, is in big trouble: her nemesis Chelsea is loose, somebody close to her is dead, and everybody thinks Gail did it. 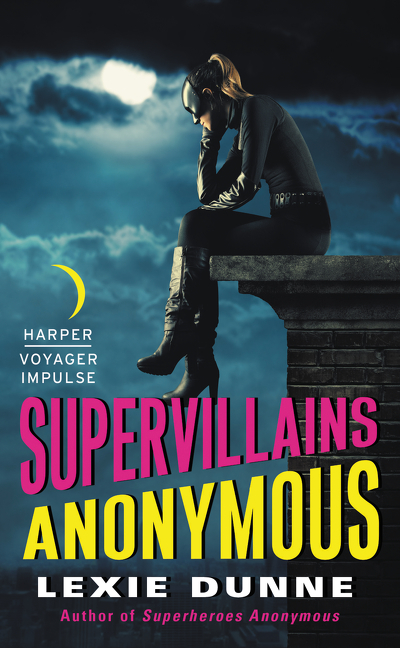 To make matters worse, Davenport Industries has thrown her into a prison that just happens to be full of the very same supervillains who used to kidnap her on an almost daily basis. This entry was posted in Writer's Life and tagged Comics, Harper Voyager Impulse, Lexie Dunne, Writing by bishopoconnell. Bookmark the permalink.